Coolutils Total PDF Converter is converts PDF to DOC, RTF, XLS, HTML, BMP, JPEG, GIF, WMF, EMF, PNG, EPS, PS, TIFF, TXT, CSV, and PDF in batch. If you want to convert a bunch of PDF files without having to waste time reading instruction manuals, then this is converter for you. 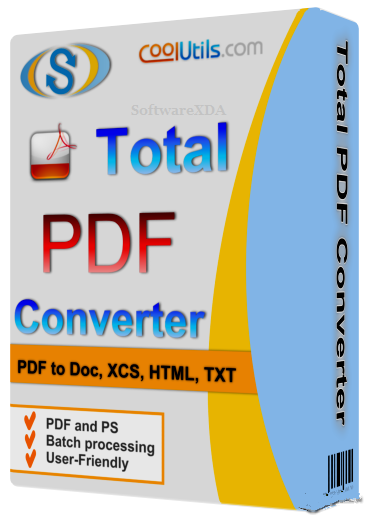 Unlike other batch PDF converters, the Total PDF Converter is extremely user-friendly due to a well-planned interface. Users can rely on predefined settings or use their own values. Total PDF Converter maintains your original folder structure so that you receive the output files in perfect order. Additionally, registered users gain direct access to command line support to allow for quiet automatic functioning on the back end.